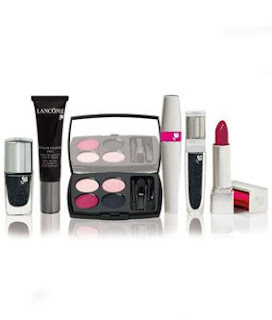 The Lancôme look for spring is Pink, Black and Irreverent. Go pretty-punk or pretty-powerful. A little treat for you at the end. Lancôme has released its new season cosmetics collection for spring/summer 2009, and under the creative eye of new Artistic Make-Up Director Aaron De Mey. De Mey created an explosively colorful look of lacquered pink lips and glittery black eyes named Pink Irreverence.